3D Models: Calum Andrews is an artist and illustrator from London. He currently lives and works from his own studio Calum 5 which is situated in London. He is a master of fantasy art, Horror and Sci-Fi artworks. He is currently a freelance artist who creates stunning 3D Models and 3D Character designs which can be found in many video games. His 3D Models are not for the faint hearted since they are awfully scary and gory. 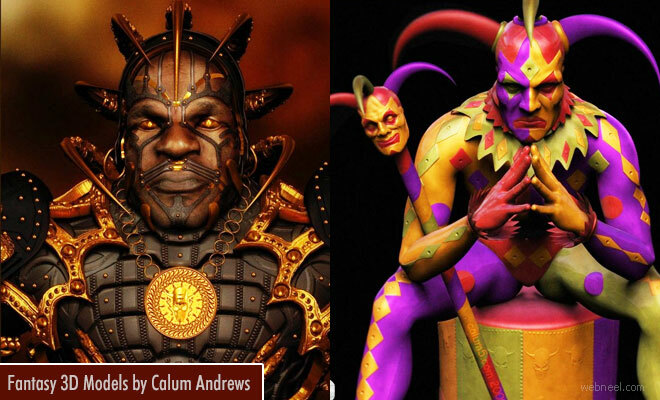 Calum's 3D Character designs have a special touch of mythical characters since you can rakshas and gods. He certainly loves to explore other cultures through his 3D character designs.